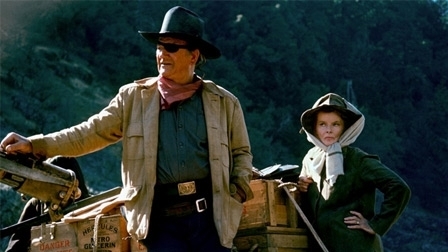 ROOSTER COGBURN, a tame, second-string follow-up in 1975 to True Grit, has some nostalgia-novelty value with John Wayne at long-last sharing the screen with another legend, Katherine Hepburn. Sparring ala The African Queen, the elderly titans work smoothly, but it’s for 108 minutes of tired piffle, even as backed by pleasing southern Oregon scenery of the Deschutes and Rogue rivers. Written by Martha Hyer, it was directed by Stuart Millar, whose fumbling pleased no one, least of all the cranky, demanding, pneumonia-plagued leading man. Poor reviews scorned the concoction, yet it did amass $17,600,000. Hepburn enjoyed working with Wayne: their opposing political stances didn’t affect their mutual admiration. With Richard Jordan (overacting like mad), Anthony Zerbe, John McIntire, Paul Koslo, Strother Martin and Andrew Prine. Fortunately for posterity, Wayne’s next, 168th, final film was The Shootist, so he went out with a hawk instead of this derivative woodpecker.